The Metuchen Cursillo Movement’s 10th Annual Encounter With Christ will be held on Saturday, April 6, 2019 from 8:00am to 3:00pm at Mary, Mother of God Church, 157 S. Triangle Rd, Hillsborough Township, NJ 08844. Our distinguished speakers will be Fr. Glenn Sudano, CFR of the Franciscan Friars of the Renewal (St. Joseph Friary, New York, NY) and Deacon Sal Bonfiglio, OFS (Secular Franciscan Order). 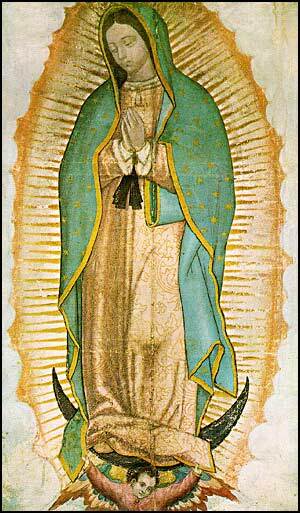 The theme of the Encounter is "Our Lady of Guadalupe - Star of the New Evangelization". Bishop James Checchio will be consecrating the Diocese of Metuchen to Our Lady of Guadalupe on December 12, 2019 for the purpose of a New Evangelization. In his letter announcing the consecration, Bishop Checchio wrote that he was doing so with a particular expectation: "namely, that after having been renewed and awakened in faith, that each and every heart in our parishes would be on fire for her Son, Jesus Christ. And, in doing so, that a new great wave of evangelization would spring from our parishes and institutions." This year, parishes within the diocese will be hosting "The Awakening", an event that will help to prepare their parishioners for the consecration. The Metuchen Cursillo Movement is pleased to sponsor this event for Mary, Mother of God Church in conjunction with the Cursillo Annual Encounter. In Cursillo, our motto is "Make a Friend, Be a Friend, Bring that Friend to Christ". We embrace the opportunity to participate in a spiritual renewal in the Diocese of Metuchen and we invite you to join us in growing closer to Christ through His Mother, Our Lady of Guadalupe. In addition to the illuminating presentations, there will be opportunities for reconciliation and adoration of the Blessed Sacrament. A light lunch will be served. The event will conclude with celebration of the Mass. Join us! You don't want to miss this special event! BRING A FRIEND… ALL ARE WELCOME!